"Horse Shelter Needs - Keeping Your Horse On Your Property or at a Boarding Stable"
Horse boarding arrangements vary from pasture only to full board. Horses can be kept at your own place or boarded at a commercial stable. Keeping a horse on your property provides more management control, saves time and expenses, and can reduce the risk of injuries and disease. A horse kept on your property allows greater enjoyment and learning experiences; however, it also requires more management, knowledge and time. Remember, horses must be cared for daily and need proper horse shelter and space. When it comes to providing adequate shelter for domestic animals, horses are among the easiest you'll deal with. Contrary to what you might think, horses are sturdy, adaptable creatures, and horse shelter needs are very basic: shade, ventilation, protection from the elements, and comfortable, dry footing. Building a horse barn is quite a project--and there is a vast and varied array of plans available to help you. But renovating a horse shelter to make it fit for just one or two horses, or building a sturdy three-sided shelter, can be quite simple, if you have only basic carpentry skills or are on a limited budget. A common type of structure used for horse shelter is an open-front building or lean-to. Open front buildings can either be permanent or portable sheds. Portable structures can be moved to allow removal of manure or to allow it to be relocated as pastures or paddocks are being rotated. Face the run-in shelter so the open-front is facing away from prevailing winds to offer better protection from rain and snow. At minimum, 80 square feet of floor space per average 1,000 pound horse should be provided. A 10'x12' structure would be better, and a 12'x12' structure would be ideal per horse. 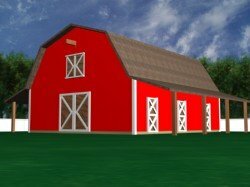 So if you have two horses, the ideal run-in shed would be 12'x24', though a 10'x24' shed would be adequate. Most prefabricated run-in horse shelters are between 8 and 10 feet high on the backside and 9 to 12 feet high on the open side. Boarding Stables: Horse boarding arrangements vary from pasture only to full board. Some considerations of boarding are seeing what amenities are included or available such as a stall, an exercise area, feeding, mucking the stalls, pasture, riding trails, training, or tack shop. When considering a horse boarding facility you should evaluate how well the facility is managed, what is the condition of the current boarded horses, and if the facility is meeting health requirements. Be sure to find out about the boarding facility's insurance coverage ~ does it provide coverage for your horse, for when you or a guest are on the premise, for your stored tack, and what are the exlusions? Personnel at the horse boarding facility should be professional, experienced and reliable. Find out if someone is on the property of the horse boarding facility at all times (24 hours a day, 7 days a week). If you are thinking about insuring your horse, most insurance companies will not provide coverage if someone is not around 24/7. It's also important to always have someone on site in the unlikely event of your horse gets loose or there is a fire. Having someone always on site also acts as a deterrent for horse theft. A walk through the barn and areas where horses are kept should provide you with a general idea of the overall health and care quality of the facility. Check the ventilation and see if feed is properly stored. Thin or excessively obese horses may indicate poor management or a lack of horse knowledge. Facilities in need of repair can result in more injuries and may be an indication of the quality of care your horse will receive. A quality horse stable does not need to be extravagant, just safe and well maintained. Horse Space & Horse Shelter: Your horse needs a large exercise area like a corral. The minimum exercise area should be about 1/8 acre, but 1/2 acre is better. So, a horse without managed pasture and is fed primarily hay needs about 1/2 acre, and with managed pasture needs about 1-1/2 to 2-1/2 acres. Your horse also needs a natural or man-made shelter from the weather - both hot and cold. Horse shelter may vary from a protective grouping of trees, to a 3-sided lean-to shed, to a complete stable with stalls. A man-made shelter needs to be clean and well ventilated with no drafts. The minimum requirements for a box stall is 10ft. wide by 10ft. deep by 8ft. high with a 4ft. by 8ft. door. An important management task is "mucking-out" a horse's stall daily. Mucking-out a horse stall is removing all of the solid waste and soiled bedding. Enough clean bedding should be added daily to provide a comfortable and absorbent bed. Before laying down new bedding, you could spread a light layer of hydrated lime on the ground to absorb moisture and to deodorize and disinfect. Cost, availability, and storage needs are some factors in selecting bedding. The bedding material should be dust-free, help to mask odor, absorb urine, be comfortable for the horse, and provide a secure footing. Straw is the most common bedding used. Fencing: The most important thing about a fence is it must be visible to the horse, whether using a traditional board fence, rail fence, or electric wire fence. The fence must be visible to the horse to prevent it from becoming tangled in the fence or running through the fence. If using an electric fence, wide ribbon wire is best. Electric fencing should only be used as an interior fence, never as a major exterior fence. Tip: Have limited horse space? Consider a three-sided run-in shelter. Unlike humans, horses do fine even in severe weather. If you will have 2 horses, you will need one built that is at least 10 x 20 feet. By putting a panel down the middle, you can convert the shelter to 2 horse stalls.